From April 1- 10, 2008 Teresa Tomeo (Catholic Connections Radio Show) and I will lead pilgrims to the Holy Land. 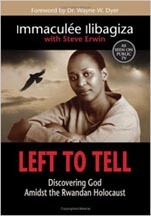 We have a special host going with us — Immaculee Ilibagiza, author of the New York Times best-seller "Left to Tell." Immaculee is a world-renowned writer, international speaker and Catholic survivor of the genecide in Rwanda. She will host the April Pilgrimage to the Holy Land! Click here for the 4-page brochure. Register quickly since the seats are filling fast! For more information or to register in advance, call Susan Parran at Corporate Travel at sparran@ctscentral.net, or call her at 313-565-8888, extension 121 or toll-free at (800) 727-1999. Want to join us? This pilgrimage is filling up quickly, so act fast.